Saffron, rose jam, vanilla and sandalwood… Apart from the last ingredient, you’d think this Indian or Persian-accented blend would be better in a spoon than sprayed on your cleavage. And you’d be wrong. At least I was, when I realized that I’d fallen head over heels for Safran Troublant, and the odd cat-like sense of comfort it gave me. I must admit it was practically love at first sniff, and one of the very rare occasions in which I didn’t apply the three trial rule. Truth be told, the atmosphere, in L’Artisan Parfumeur’s Parisian flagship store just behind the Louvre was conducive to impulse buying. I’d gone there with my friend K., my habitual sniffing companion, to smell Olivia Giacobetti’s compositions. She’s just re-launched her brand IUNX in the boutique of the Hotel Costes, and I wanted to review some of her compositions before analyzing further her Éther, L’Eau Blanche and Splash Forte (reviews coming soon to this location). Like Dzing, L’Été en douce (formerly Extrait de Songes), Passage d’Enfer and Fou d’Absinthe, Safran Troublant was part of the program. But I hadn’t counted on being guided through my explorations by the charming, warm and enthusiastic Stéphanie Bakouche. The ISIPCA graduate, who has recently been recruited by L’Artisan to train the staff (she also offers sessions to the public), is also the talented composer of one of Parfums MDCI’s two masculine fragrances, Invasion Barbare, a spice-laden lavender that redefines the fougère genre. 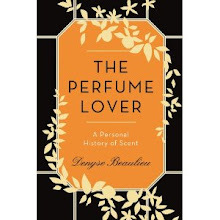 Sniffing while talking to a perfumer… I was done for. In order to prevent the air of the boutique from being saturated by too many conflicting smells, the L’Artisan fragrances are presented in glasses in which a scent-imbibed muslin is folded. I kept being drawn back to the Safran Troublant glass, a little surprised that I liked it so much – I’m not much of a rose lover, and not really into gourmands. But Safran Troublant avoids the Turkish delight trap – Olivia Giacobetti is morally incapable of being heavy. Still, unlike many of her other ethereal, vaporous, almost immaterial compositions (Frédéric Malle En Passant, L’Artisan L’Été en douce, all the IUNX), Safran Troublant has a creamy, milky density (K. said it reminded her of the saffron-steeped warm milk she drinks in Sweden at Christmas). The fragrance opens on the almost peppery, leathery, medicinal bouquet of the featured note, which cuts through the opulence of the rose – rose jam, cooked and simmered, rather than fresh rose petals. 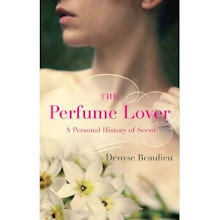 The lacteous, slightly burnt notes of sandalwood and vanilla soften the acidity of the rose and the bitterness of the saffron while rounding out the latter’s hay note. While researching other reviews of the scent, I stumbled on two extremely tempting recipes, one for a saffron-rose yogurt mousse, by the brilliant Victoria of Bois de Jasmin, and the other for a saffron cake, by Glass Petal Smoke’s Michelle Krell Kydd. I couldn’t resist adding the links. They are mouth-watering, to say the least. 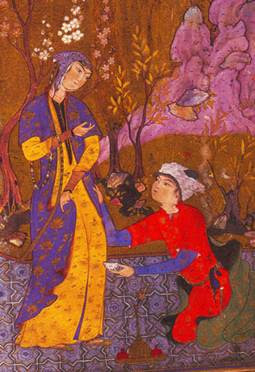 Image : Persian miniature, courtesy of Windchild.net. I'm not sure I know what a saffron note would really smell like. I know I adore Noir de Noir by Tom Ford, and I think it may be the saffron note that helps cut the sweetness in the drydown for me. If you've tried that one, does it have a strong saffron note? This sounds really amazing though, and it's making me crave Indian now. The best Indian cuisine uses it but often it's replaced with the "poor man's saffron", turmeric, which also lends a rich golden hue to dishes. You'd have to think of the common point between an excellent biryani, risotto milanese and paella to have an idea. I haven't worked my way through all the Tom Fords yet, but I'll make sure to smell Noir de Noir next time and see if I can pick saffon out. I actually just bought a small vial of it to add to a sort of bouillabaisse that I made as a special treat for the bf. I guess I should just go smell that and see what I get. And now I want bouillabaisse (probably one of my top 3 favorite foods). Oh, don't get me started on that. One of my best friends lives in Marseille and there's this little restaurant near the old port... How can one not be a foodie when one's a perfume lover?